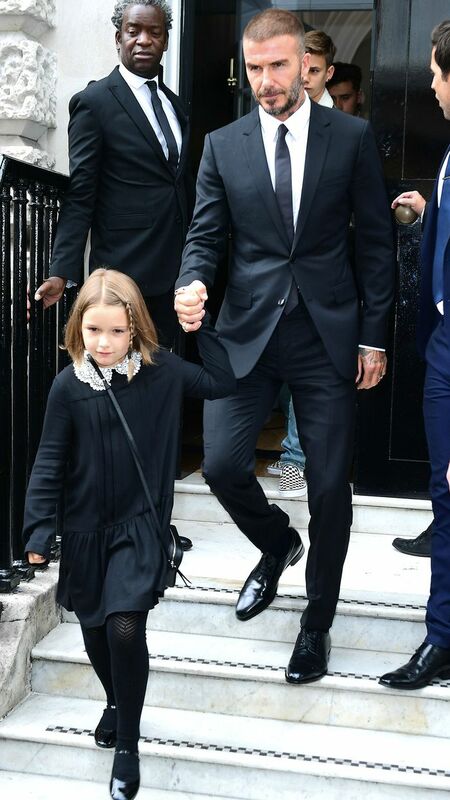 Harper Beckham is one lucky girl. She’s the mini style icon who undoubtedly has a better wardrobe than the entire Who What Wear team combined. Today saw the latest instalment of "Harper Beckham outfits we wished we had," with the 7-year-old spotted walking into her mum’s fashion show wearing a seriously cute black dress with a delicate lace collar and ruffled skirt. Hand-in-hand with her dapper dad, David Beckham, Harper is no stranger to the FROW and has clearly been taking notes from Victoria Beckham’s paired-backed aesthetic (or, you know, giving sartorial direction to the nanny). Also, can we just talk about her accessories for a second? Those patent Mary Janes and jewelled headband are very ’90s Ashley and Mary-Kate Olsen. Scroll down to see her look.